"At the epicenter of literary New York, Menaker is an irreverent guide to the publishing world's inner workings. . . [and] tells great stories about editors William Shawn (quirky), Tina Brown (in hot pursuit of what's hot), William Maxwell, Roger Angell and others. . . His own journey, compelled by his self-knowledge and sense of humor, elevates this memoir into more than witty chatter." "[A] sparkling gem of a memoir... The writing simply shines; it's at once jaunty and erudite. I kept wondering, "How does he do that?" "Menaker gives readers a glimpse into the less-than-rarefied world of fiction — publishing, marketing, buying and selling. And it's fascinating. . . But Menaker also can be funny and lighthearted." "[Menaker] is an expert at turning those proverbial life-lemons into lemonades; his description of his protracted recent struggle with lung cancer, for example, winds up being one of the memoir's most inspiring and invigorating sections." "Menaker's memoir captures a pair of lost worlds: the old lefty Greenwich Village, where he grew up in the 1940s and 1950s, and the byzantine kingdom of The New Yorker, where he worked for 26 years, mostly during the peculiar editorship of William Shawn." "How can something written so accurately be so witty? Don't you have to cheat a bit to wring the humor out of life? Daniel Menaker has constructed a compelling tale that irises down to a powerful and emotional climax and is delivered in exacting prose woven into affecting poetry." "Daniel Menaker's distinctive journey through his own memories is impossible to resist—and not just for those of us with an appetite for literary anecdote. My Mistake is also the story of literary New York, with keen, vivid impressions from Menaker's Forties childhood, Cold War coming-of-age, and long career at the epicenter of the publishing industry during the onslaught of the Digital Age." "I can't remember when I've read a memoir this—let's say 'soulful.' Funny, sad, and wryly self-aware, Menaker shines a bright light on his own background, our literary life, and his own path through it." "My Mistake brings to mind the poetic prose of James Agee. Menaker's stories of life as fiction editor at The New Yorker and Random House are a delight, the way he tells them simply perfect. Humorous, thoughtful, heartbreaking and brave. 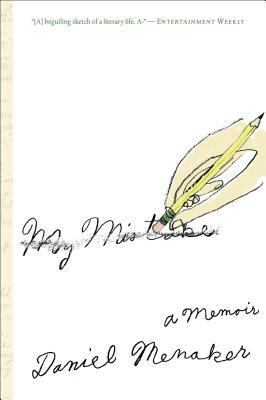 I have not enjoyed a memoir more."